Folks who don’t normally attend book discussions are encouraged to attend one of our One Book, One Valley discussions. These meetings are not only for avid readers and deep thinkers, but can be fun ways to socialize (face-to-face!) with some new people and talk about something you all have in common. 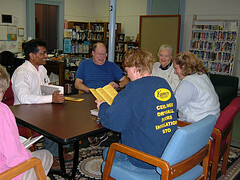 Those who regularly attend book clubs will attest that a variety of voices and views makes for a lively and interesting discussion. It’s a good idea to read the book. But, if you didn’t finish, come anyway. No promises for no spoilers, though. It’s okay to come if you didn’t like the book. Some of the best book discussions happen when not everyone in the group shares the same opinion. It’s okay to just listen to the conversation, you don’t have to weigh in on every point. Most of the time, there are refreshments. There are three book discussions of “Go With Me” this week (and also during the two following weeks), so find one at a convenient time and place and please join us!